Professionally designed HTML Resume Templates which are available for free download are hard to find as most of the templates are either outdated or lack the class. But in this post we present to you some of the mostly elegantly designed, clean and modern resume/CV HTML & CSS templates which are completely free and will help you establish a professional resume/portfolio site. 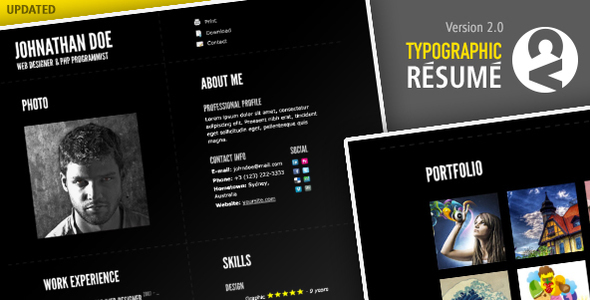 Previously we rounded up free minimal & creative resume Templates in PSD, Word & AI format. In this post we will be looking at HTML & CSS based resume templates. Whether you are fresh out of college or an experienced professional, these resume templates would surely make your portfolio impressive. At the end of this post, we have included some tutorials for you to build your own professional resume or CV website in HTML5 and CSS3. You will also find premium HTML resume templates in this post, which we included to give you a glance of some of the paid options available. After all this is your career we are talking about and you should have all the choices available to make a perfect impression with your portfolio. Let us begin! 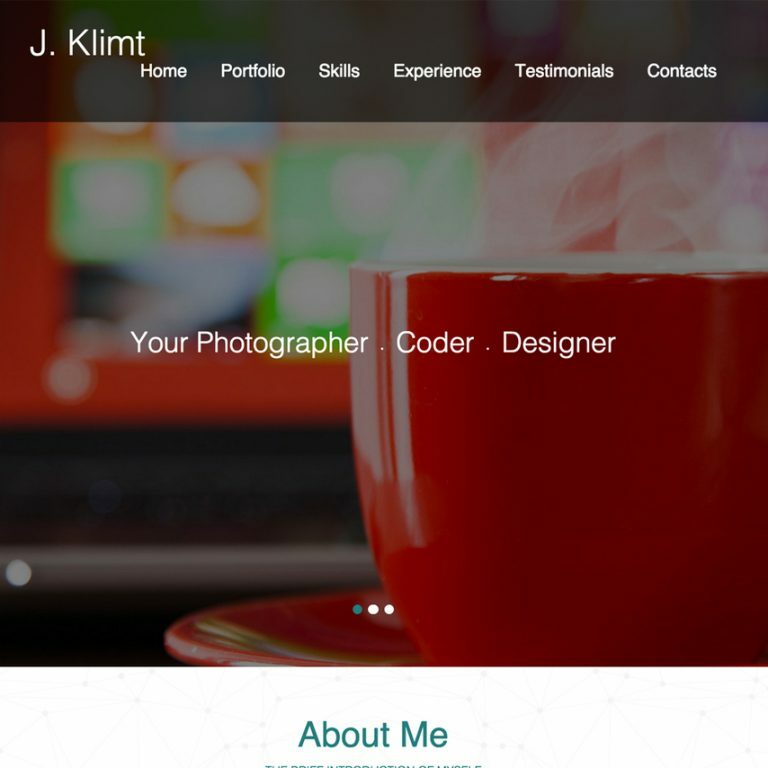 Find below some of the best resume website template built with HTML & CSS. Do note that these website templates are for building static HTML websites. 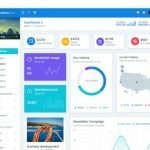 If you are looking for WordPress theme instead then take a look at these resume WordPress themes. 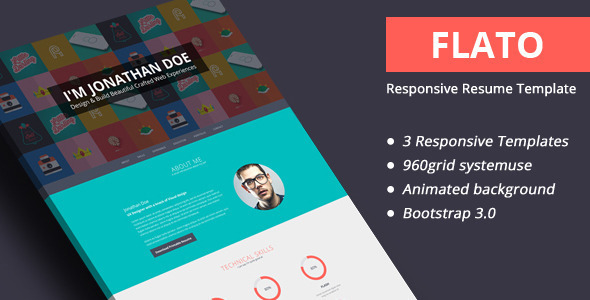 Creative CV is a professionally designed responsive and free resume HTML template. 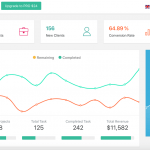 It has been built by TemplateFlip with Bootstrap and Now UI Kit. This modern design template is perfect to showcase your Bio, skills, portfolio, work experience, education and references. You can easily to edit, customize and extend the template as per your needs and create your very own website featuring your resume/portfolio. 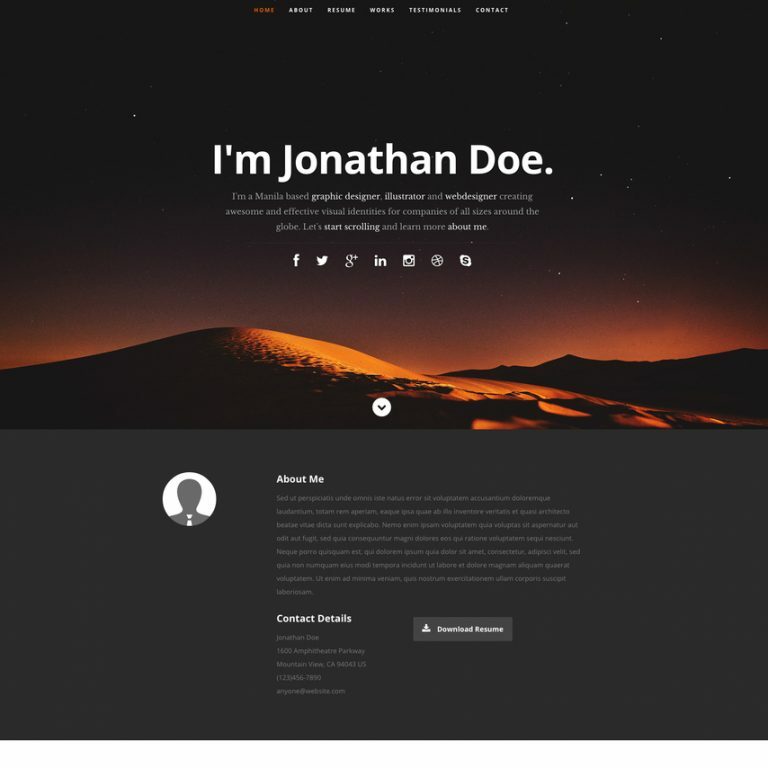 A one page resume website template with clean layout offered by CSS Tricks. The contact information is using microformats and the template is print-ready. 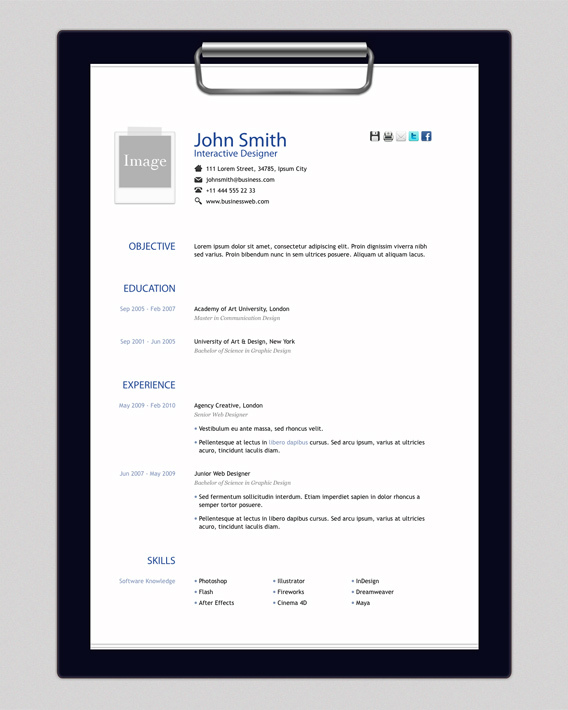 This Sample Resume Template is a simple and quick way to build a HTML resume. To get started, download the files and edit them in your favorite text editor fter which you can upload it to your web server or export to PDF. 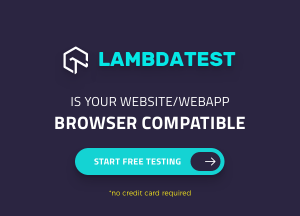 It is totally free to download. This is a simple curriculum vitae template built with HTML and CSS using responsive webdesign. It is completely free for commercial use. The Ceevee Resume Free Responsive Website Template is the perfect template for showcasing your online resume. Built in the minimal design style, this website is trendy and will allow the viewer to focus on what’s important–your skills, experience and assets. This template is fully responsive so it will look great on every type of design. 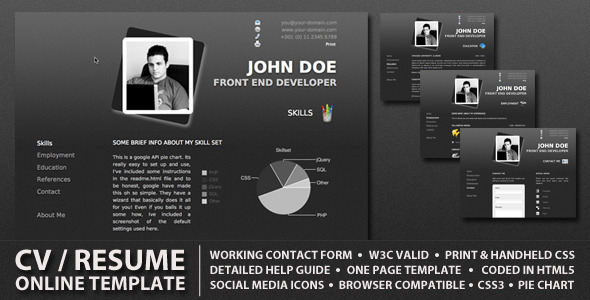 One Resume is a free one page web template that features a smooth jQuery slide between sections of the page. 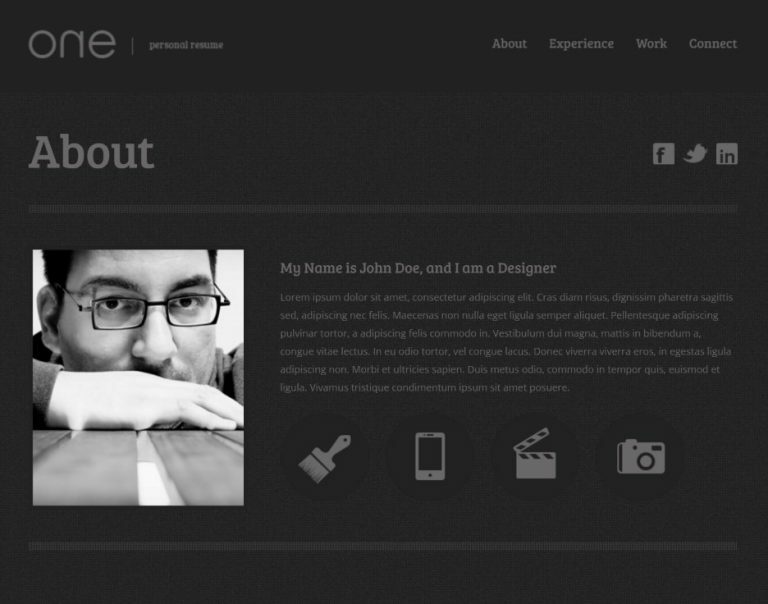 This template is perfect for a solo designer to general personal page. The template is clearly coded and commented for easy editing and expandability. 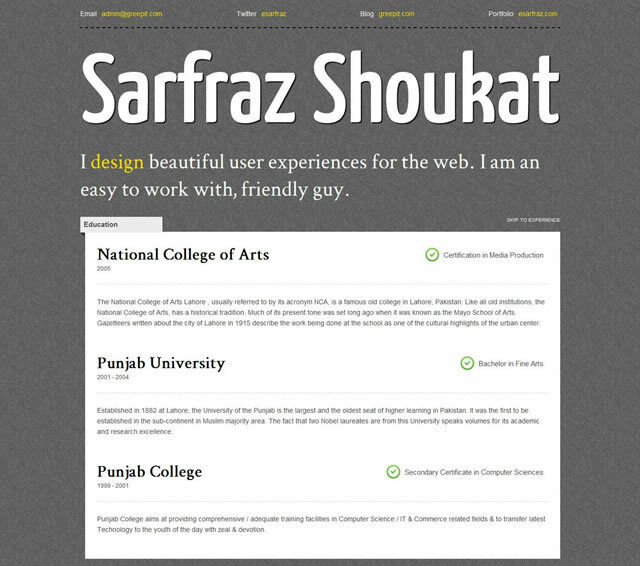 This template has been designed by Sarfraz Shoukat with web designers and developers in mind, as a means to not only exhibit your profile and experience, but also as a means to show off and highlight your skills. This lightweight template makes use of open-source fonts, tastefully chosen CSS3 properties, its CSS and HTML validates and finally it renders beautifully well with Firefox, Safari, Chrome and even looks good with IE. This free HTML5 One Page Template will help you set up a personal page and successfully sell talents. This is a professionally created CV website that can help you promote your skills, get more business propositions, and find new clients. Try this clean modern design to push your career forward. 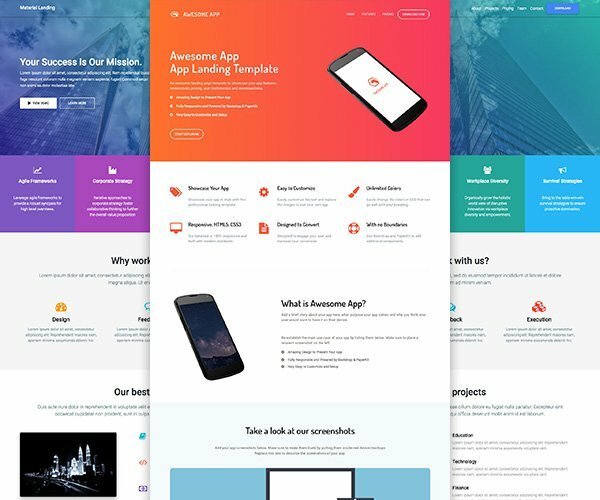 The Brandy Portfolio free responsive Bootstrap 3 template is a clean, simple yet creative template for featuring your development and design skills online. The light colors used in this template will allow viewers to focus on what’s important–your work and design experience! 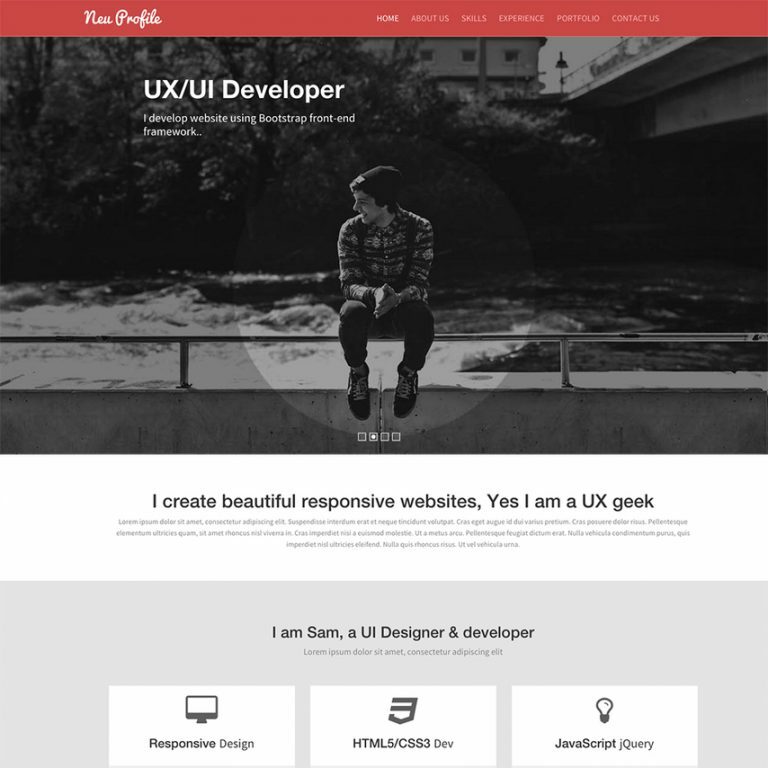 Neu Web Designer Free Responsive Bootstrap Website Template is a perfect template for a web designer, programmer portfolio, or another similar job. 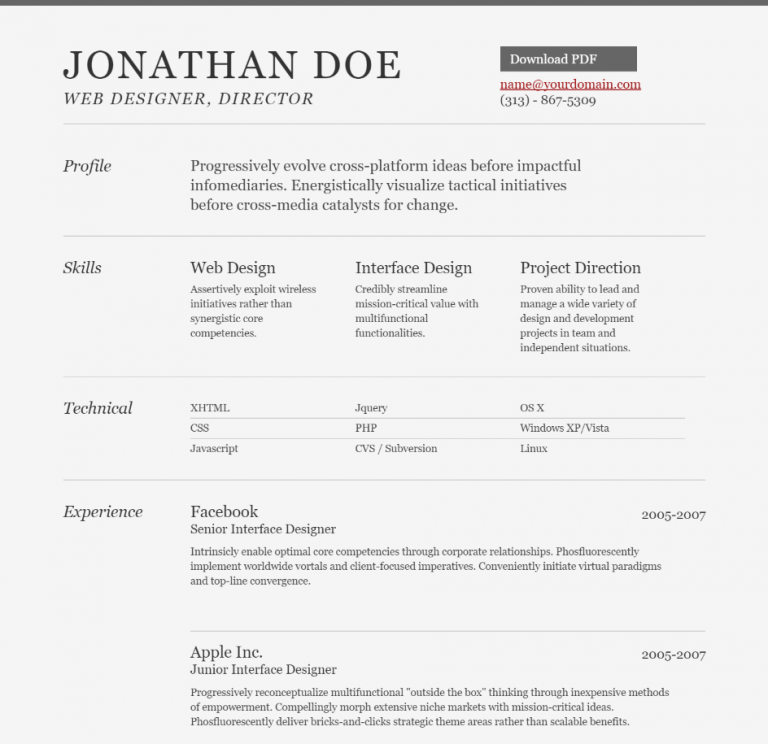 This is a clean and modern template that will showcase your work similar to a resume or CV. 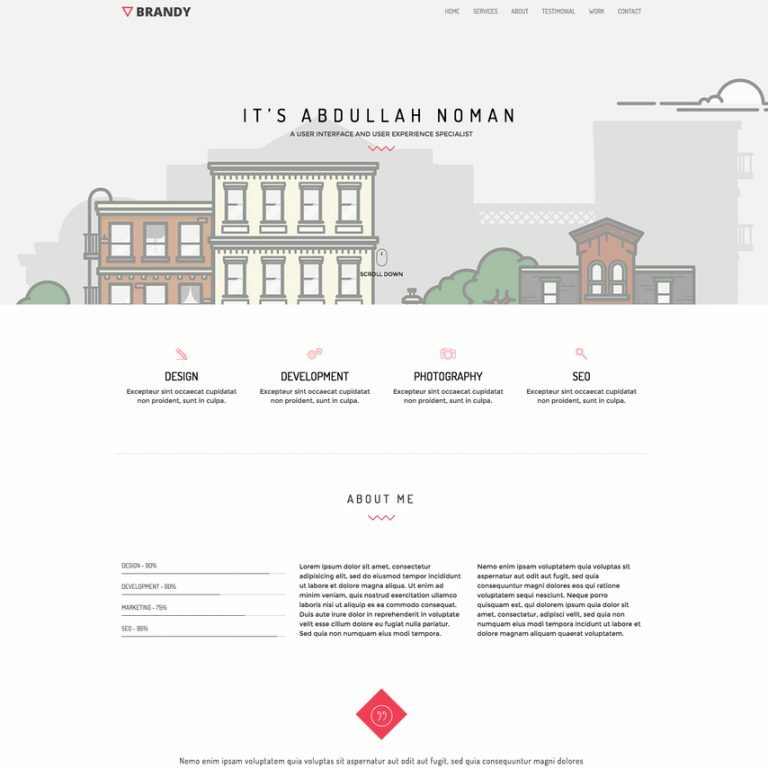 The template was built using HTML5, CSS3 and Bootstrap. This is a one page HTML 5 template which responsive and built with twitter bootstrap. It is pretty simple and easy to configure. When the need is to make the perfect first impression with a visually striking resume which stands out from the crowd then some of the free resume templates above may not be enough. 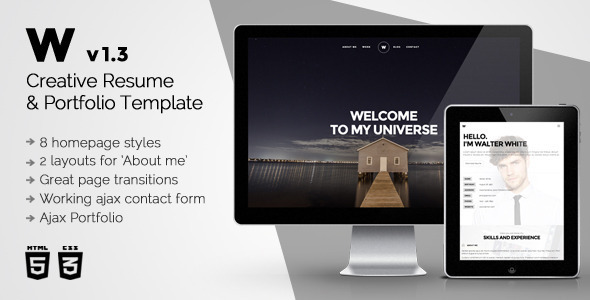 We present to you carefully selected premium professional templates from ThemeForest and CreativeMarket which are sure to wow anyone. These templates also offer multiple customization options and different layouts for you to choose from. 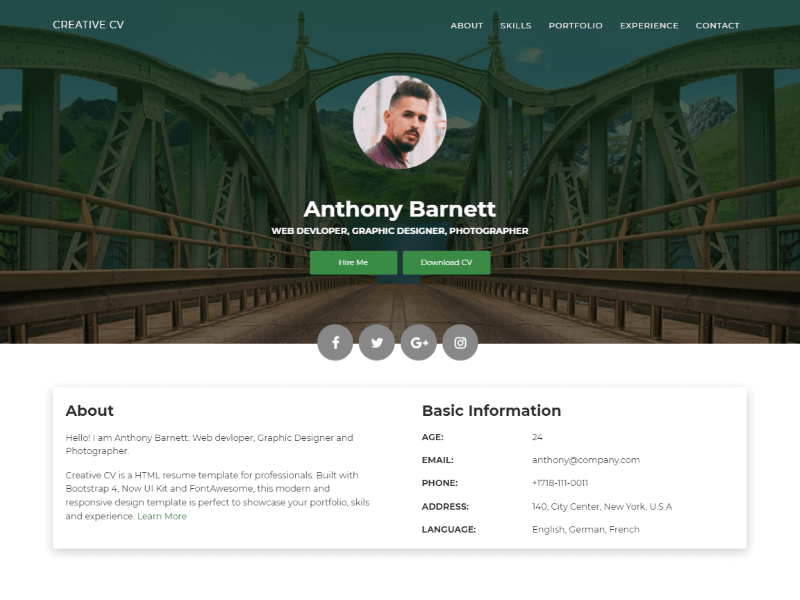 This is a material design CV/resume template with a fully responsive layout. This is an ideal template for any type of profession as well as creative studios and companies. It perfectly suits for placing information about your experience, skills, education, works, awards and expertise. You will be able to add a blog as well to your website. 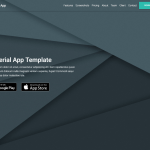 I’mRex is another material design responsive one page HTML5 template. It has all the features to make responsive website for Developers, Designers, IT Professionals and so on. It comes with 100% responsive features so that it will look perfect on all modern devices including iPad, iPhone and Android phones. 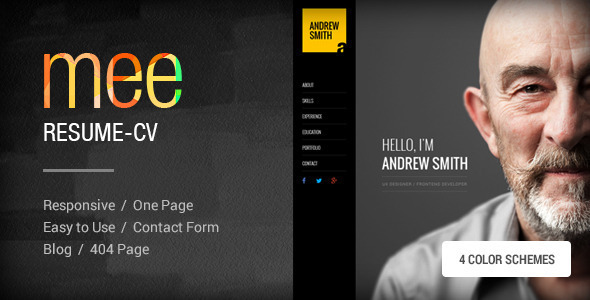 This is a creative resume & portfolio template with 8 different homepage styles and 2 layouts for ‘About Me’. 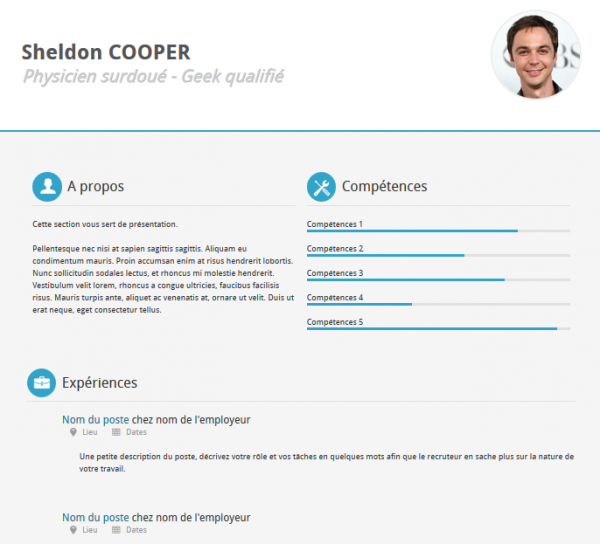 It is based on Twitter Bootstrap and made to show your resume (education, work experience, skills, etc. ), portfolio and blog in a wonderful way with an unique and beautiful piece of design. 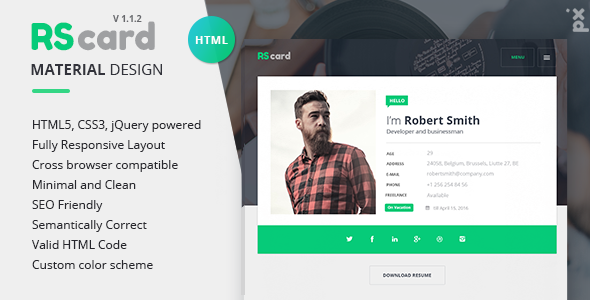 “Flato” is a flat, minimalist, professional & multipurpose vCard for placing your personal information, whether you are a designer, programmer or manager. 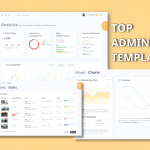 This is one page resume template has features like animated Image grid background, full width background slidshow, pie chart skills and working PHP contact form. It is built with Bootstrap. 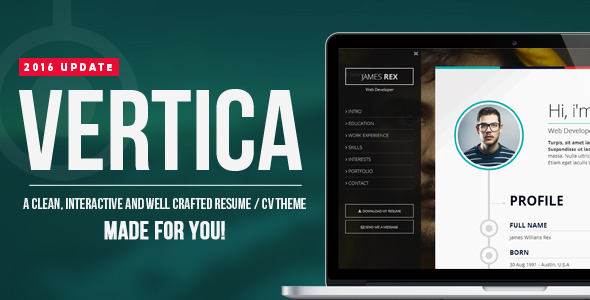 Vertica is a clean, multipurpose and well crafted HTML resume template. It is focused on digital professionals, programmers and photographers. 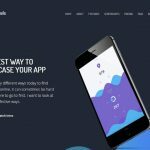 It features an unique and interactive timeline, is 100% responsive, retina ready and is built on Bootstrap Framework, with easy customization. It also have smooth scroll, improving the user experience on all devices. 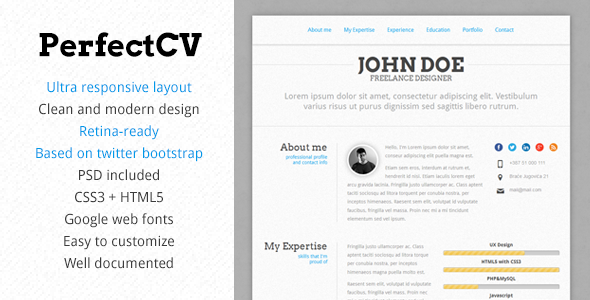 PerfectCV is based on Twitter bootstrap and is retina ready responsive HTML resume template. Built with clean and modern HTML5 + CSS3 code, it’s easy to customize, well commented and well documented template. Typographic CV is online resume / CV template which has strong typographic design, good visual hierarchy, unique layout, cool gallery section and much more. 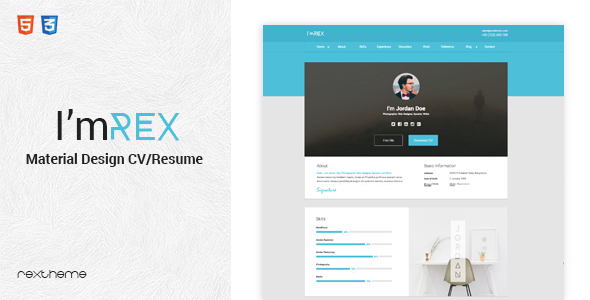 Mee is clean, minimal and professional looking resume template. 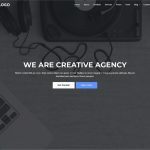 This template is suitable for anyone who wants to have a personalized resume website with unique style, layout and colors. This template includes 4 color schemes, blog pages and 404 pages also. How to choose the perfect HTML Resume Template? The template should be easy to edit so that you can tune it to perfection with your own details. If you are familiar with frameworks like Bootstrap or Foundation then look for resume templates built with those frameworks. Resume templates which offer customization options such as multiple fonts, colors and layouts are better to have in order to make them fit for the need. This one is very important and you should always read the licensing information associated with a free resume template. 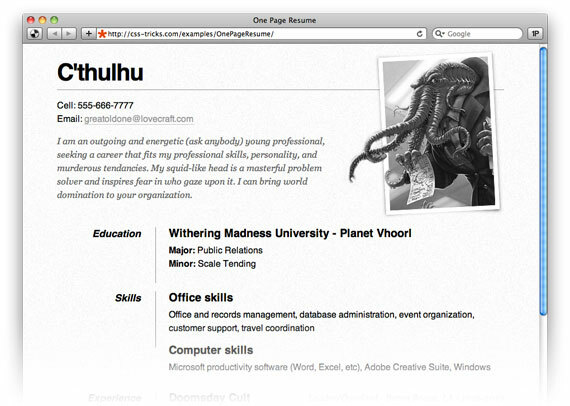 How to build resume in HTML5 & CSS? You can also refer to the above tutorials in order to customize the free and premium HTML resume templates we covered earlier. While you can always go for the traditional approach of building a resume in a PDF of Word file (did we mention we have some great resume templates in Word, AI and PSD), having a web based resume will not only help you share your resume in seconds with just a link, but will also get you noticed to potential employers and clients via search engines like Google. Let us know how you find our collection and resources of these professional Resume/CV HTML & CSS templates in the comments below.